Is your dog the Stud of the dog park? Maybe your little Romeo sired litters all over the neighborhood? If so- than this bandana is for you! These 100% certified organic Turkish Cotton dog bandanas have a fashionable cover-stitch edge, silver stud embellishment, and quality silk screened lettering. They are completely machine washable and prewashed to avoid shrinkage. Bandanas are hand screened in the USA with love. 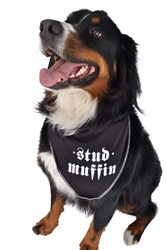 StudMuffinBandana-0001 Stud Muffin Bandanas - a) Small: L 21" W 12.5"
StudMuffinBandana-0002 Stud Muffin Bandanas - b) Medium: L 26" W 18"
StudMuffinBandana-0003 Stud Muffin Bandanas - c) Large: L 37" W 24"